True and Sub-Zero are now competitors in the undercounter beverage center niche for the first time. True has always been commercial, while Sub-Zero is residential. Both are the highest quality. Customers always wonder how the same size refrigerator with the same capacity can be so different in price. You can buy a basic refrigerator for $200-$400 like a Frigidaire, Summit or endless import names versus $1,100-$3,500 for a Sub-Zero, U-Line or True. A freestanding refrigerator has a plastic case with a condenser on the back of the unit. It is not designed to be placed between cabinets. Eventually the heat, unable to escape from the back, will seize the compressor causing the refrigerator to malfunction. Other differences are steel vs. plastic cabinet as well as temperature differences in the unit as well as the quality of the shelving. I am not bashing the freestanding unit, but they are very different products. What is a Beverage Center? 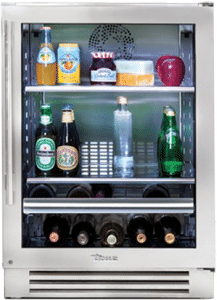 A beverage center differs from wine or undercounter refrigerators, because it holds both wine and refrigerated items. Beverage centers are the fastest growing segment in the undercounter niche. The True Professional Series is a division of the True manufacturing company. The True Manufacturing Company was founded in 1945 in O’Fallon, MO. The True manufacturing company is widely known for producing commercial refrigeration. 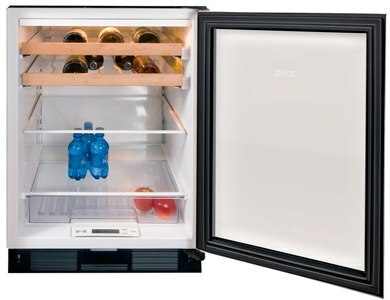 True has recently launched a residential line consisting of wine storage, beverage centers, and refrigerator drawers. Sub-Zero was founded in 1943 in Madison, WI. Today it is the second largest family owned appliance company in the world (next to Miele). They were the first company to manufacture undercounter wine storage units. 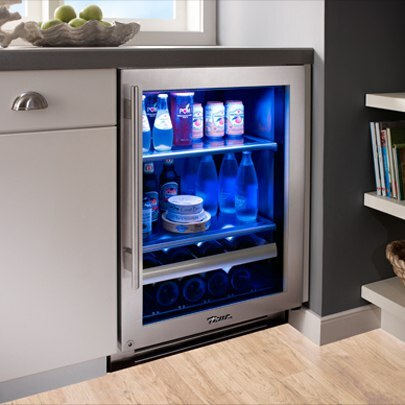 Today, Sub-Zero is well known for producing high quality refrigeration products, especially in built-in refrigerators, beverage centers, and wine storage units. It is not often when I compare Sub-Zero and it's the much cheaper product. Sub-Zero has always been the standard in refrigeration, and for good reason. Their undercounter units are reasonable and in line with other residential products like U-Line, Marvel and Perlick. True is a different type of product. It has a commercial heritage and as such is heavier and the most well constructed unit in the industry. This is a unit rated for the outdoor use. It can be stacked and has really solid shelves as well as incredible lighting. It is a consideration as long as its durability can justify its premium price. For customers looking for a versatile product with unique features I would recommend a True beverage center. These units can be stacked, installed indoors or outdoors, and have shelves replaced with wine racks for optimal versatility. This product also comes with three shades of interior lighting to best fit the mood or design of your kitchen; I personally like the blue shade. Download our Refrigerator Buying Guide for features, specs and recommendations for all types of refrigerators. Over 100,000 people have already found answers in a Yale guide.